Julien Sinzogan was born in 1957 in Porto-Novo in the Republic of Benin. Having lived and worked in Paris, France for nearly thirty years, he has recently returned to Benin. 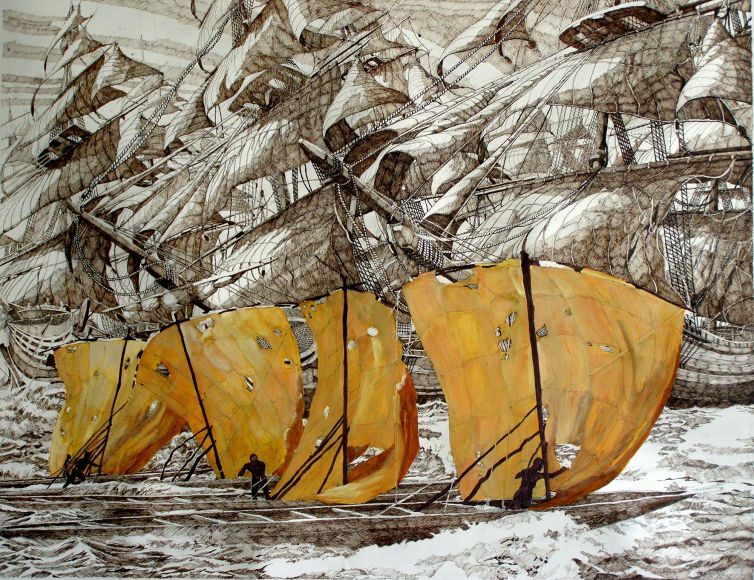 Sinzogan began his career studying architecture at the Art School of Tashkent in Uzbekistan from 1978 – 1979. He continued his studies in this field at the École Spéciale des Travaux Public in Paris, France, which he completed in 1982. The following year, he enrolled for a course at the Laboratoire International de Calcul et d’Informatique Appliquée in Paris, where he ran the department of computer images. Thereafter, he turned to the full-time development of his career as a professional artist, specialising in figurative painting, often using encre de chine to trace drawings that he would then highlight with colourful overlays. Strongly influenced by the Yoruba divinatory and religious system (Ifá), Sinzogan’s paintings explore the journeys between physical existence (aye) and the spiritual realm (orun) through which spirits are reborn. Sinzogan’s work investigates the passages between these different realms of existence. 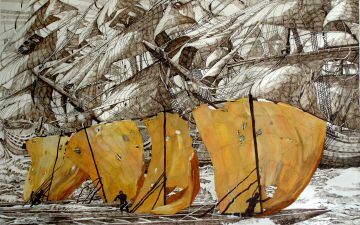 The voyages between such realms lie at the heart of religious practice across much of the Atlantic world, a world forever shaped by that other historical voyage – the“middle passage”of the Atlantic slave trade. Sinzogan’s faith in the migration of the African soul and the homecoming of the slave’s spirits who journey back to West Africa, returning from their exile following the transatlantic slave trade, speaks of the greatest violation: the broken thread of ancestry and the loss of ancestral spirits who departed to the Americas. Sinzogan produced the monumental commissioned artwork entitled Gates of Return, to decorate twin portals of the atrium of the prestigious Victoria & Albert Museum, London, during the exhibition, Uncomfortable Truths (2007). 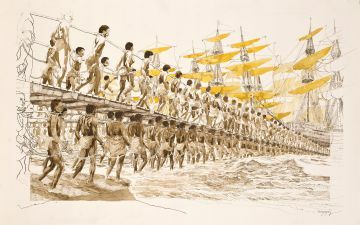 This large-scale work showed Sinzogan’s treatment of Africans deported on western slave ships finally returning, on phantom ships, transformed as spirits dressed in the richly coloured traditional robes of their peoples. Thus, he frames these portals not as sites of loss but of triumphant return. Notable solo exhibtions include: Journées ébène, Voyages: la porte du retour at the Musée de la peinture de Grenoble (Grenoble, France: 2008); Chemins d’esclaves at the Museum of Angoulême (Angoulême, France: 2009) and Spirit Worlds at October Gallery (London, United Kingdom: 2010). 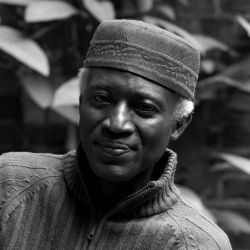 His work has also featured in the following group shows: Uncomfortable Truths at Victoria & Albert Museum (London, United Kingdom: 2007), Angaza Africa, African Art Now at October Gallery (London, United Kingdom: 2008); Jo’burg Art Fair with October Gallery (Johannesburg, South Africa: 2009); L’Art Actuel d’Afrique at Collégiale Saint-André (Chartres, France: 2010) and Africa Africans at Museu Afro Brasil (São Paulo, Brazil: 2015).